"Am I insured if DIY electrical work causes a problem"
to ensure compliance with all statutory obligations, by-laws or regulations imposed by any public authority, relating to the safety of persons or property. If you do not, we may reduce or refuse to pay any claim you may make. 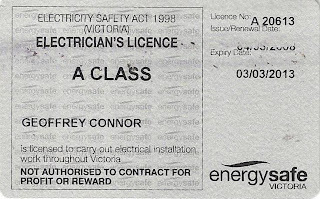 As per the Electricity Safety Act 1998 it is illegal for an unlicensed person to undertake electrical installation work in Victoria.Persons who do undertake such work can be prosecuted in the courts and subject to substantial financial penalties. Stay safe. 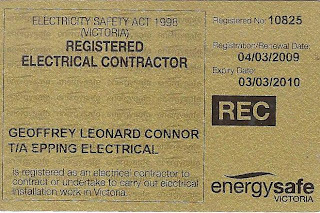 Always use a registered electrical contractor and a licensed and qualified electrician to do the work to the required standards. Ask to see their license – it is your guarantee that you are working with someone who knows that they are doing and gives you avenues for recourse if something goes wrong. Also make sure that you get a certificate of electrical safety once the work is complete. Most people, when building a new home will spend enormous amounts of time planning exact size and colour of rooms, appliances, woodwork and furnishings – but fail to seek the assistance of a qualified electrician early enough in the process to get the best possible outcome. 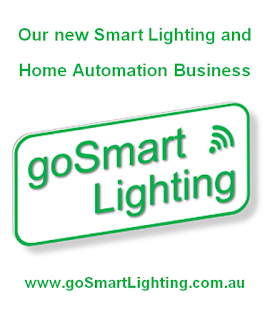 Given that the electrical work in the home will provide light, warmth, entertainment, technology and probably even cooked food – you would want the service and outlets and wiring and every detail to accommodate your lifestyle and incorporate flexibility for future changes. For the best outcome and to save time and money, engage an electrician as soon as plans are available. An initial meeting with your electrician should typically take between 60-90 minutes depending on the size and complexity of your home. Once this is complete, your electrician should be able to prepare the initial quotation that will detail all reviewed requirements. It is advisable to obtain two or three quotes before deciding on your electrician. Do not base your decision solely upon price. Consider how all prospective electricians assisted you to understand the design and implementation phases, how clear each one was when reviewing your requirements, are they all available to undertake the work within your timelines? Remember, no matter how well you planned, changes will occur so you need to be able to easily communicate with your chosen electrician. What’s the process of the electrical design and wiring for a new home? Prior to concrete pour, install underground service and builders post, extend Telephone conduits to home, normally buried within same trench. Once concrete slab is complete, install Builders Temporary Supply, normally located in final position. Your electrician will organise the required inspection and paper work for supply to be connected. You will be required to nominate the electricity retailer of your choice and open an account with them. Once the frame is constructed and windows, brickwork and roof installation is complete, the electrician can commence the “Rough-in” stage. This stage allows the electrician to run all required cables within the house frame. Normally the location of outlets and light switches are either confirmed on a final plan or ‘walked’ thru with the owner on-site. 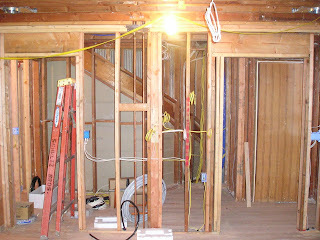 Note: Electrical Rough-in stage is normally done with plumbing Rough-in. Once the plaster is complete, the electrician would cut out all power outlets and light switch locations, down-light holes are also cut. This will allow tiling to be complete where required and will confirm all locations are found ‘BEFORE’ painting is complete. Once kitchen and bathrooms are fitted out, painting is complete, the electrical “Fit-off” stage can commence. All Power outlets are installed, Light Switches and Light Fittings are installed, Smoke detectors fitted, all appliances and finally switchboard fit out with safety switches and circuit breakers. Test and energise the installation. Simple as that. Of course there is more to it than that, but that’s a good start in your understanding. Remember to start early with your electrician, think about all your requirement in the early stages. If you do this, you will save both time and money. 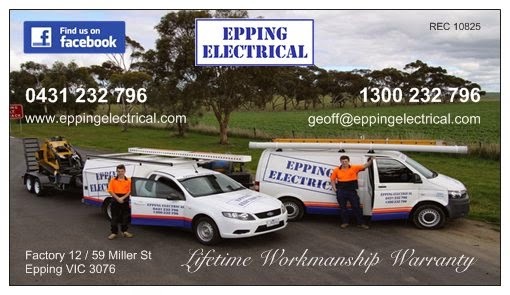 If you are planning to build a new home in the northern suburbs of Melbourne and require a qualified electrician for your project, EPPING ELECTRICAL would be more than happy to provide the initial review and detailed quotation for you and no cost. I hope you found this information informative, if you have any questions, please drop me a line or call me on 0431 232 796.